Dr Lam and his authorised master trainers conduct instructors training workshops around the world. All Board certified instructors have attended the workshop, completed prior preparation and fullfilled requirements to be a safe and effective teacher of the respective program, and registered with The Tai Chi for Health Institute. Our training is comprehensive and specific for our programs. All instructors are required to be updated every two years to maintain the certification. By 2016 there were over 20,000 instructors/leaders certified, and millions of people around the world had learned one of the programs. Over 35 scientific studies have shown the programs being safe and effective for health. Teaching tai chi for health is one of the most fullfilling experiences, almost all qualified participant who prepares well would be certified at the end of the training. Although almost anyone can participate in the instructors’ training workshop, only qualified participants will be certified to teach after they have successfully completed Steps 1 to 5 below. Please enquire with the master trainer who will be conducting the workshop for more information. 1. Enrol in a workshop: Find a workshop at Dr Paul’s workshop calender or the Master Trainers’ workshop calender. 2. Prepare for your workshop: click here for details. 3. Attend the workshop with Dr Lam or his authorised master trainer. You will learn: tai chi skill and knowledge as well as its principles and the forms how to teach the program effectively and safely how to deliver the program how to work with people with chronic conditions (such as arthritis and diabetes) safely how to work with people with different ages and conditions. 4.Register with the Tai Chi for Health Institute Board. You will be assessed on your performance of the tai chi forms, as well as completing a written test. Almost all qualified participants who have prepared prior to the workshop will be certified at the completion of the workshop, then you would be entitled to register and would be invited to register by the TCHI Board. We put great emphasis on practicality and safety, you will learn well in a friendly and interactive environment. NB: Dr Paul Lam Tai Chi for Health Institute lists all current authorized Master Trainers, Senior Trainers and Board certified instructors on this website. All levels of instructors must fullfill all requirements and attend in person respective training workshops. We are proud of the high quality of our training and strive to keep improving it. 5. Update and Follow Up: Instructor/leaders are required to renew their certification every two years in order to update your skills and knowledge of the program. You can attend an update workshops run by Dr Lam or one of his Master Trainers. Available update workshops are listed on this website at the workshop calendar. Many training workshops include updates provided it is arranged in advance and you need to complete a written assignment beforehand. Update is also available by correspondence for instructors who cannot not attend a workshop because of challenging circumstances.As with all health and exercise professionals, updates are necessarily to maintain and improve skill and knowledge. There would be new studies, development and practice emerging to improve your teaching and tai chi skill. 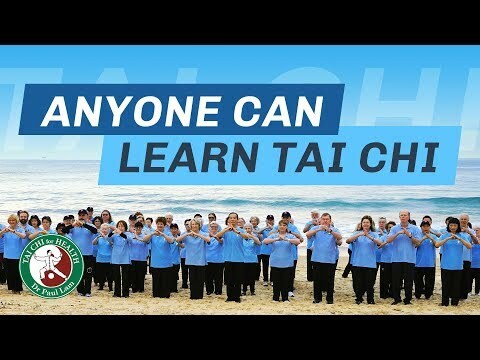 It is also an excellent time to share experience and connect with other members of the Tai Chi for Health vision.We are proud that our programs are supported by many organisations worldwide, including the Centers for Disease Control and Prevention (www.cdc.org), the National Council on Aging and arthritis foundations and many organisations around world. The quality of our programs and instructors are the reason for this level of support. Updating is a necessary part to maintain our professional status. Our standards and educational programs are constantly monitored and improved. Those instructors who allow the qualification to lapse are not authorised to use Dr Lam and the Institute’s name in their advertising. All participants who attend the workshop will receive either an instructor/leader or attendance certificate. Different programs have different requirements for preparation, but they are similar to the Tai Chi for Arthritis program (described below). It will take from 20 hours to 200 hours to prepare depending on your experience in tai chi and health education. For example an experienced tai chi practitioner would not need as much time (about 15 to 30 hours) to learn the program from the instructional DVD. Study the instructional Tai Chi for Arthritis DVD (it consists of twelve virtually real time lessons from Dr Lam), “Teaching Tai Chi Effectively” book by Dr Lam and handbook, and learn how to do the Warm up and Cool down exercises, the Basic Six movements and the Advanced Six movements. Even if you attend the workshop to learn a program for your own health and wellness, Dr Lam strongly recommend you prepare the same way as instructor trainees, as it will enable you to gain more from the workshop. Read the handbook to understand what is tai chi, what is arthritis and how does it work. The “Teaching Tai Chi Effectively” book is the text book for instructors of the Tai Chi for Health programs and would be an useful reference book for any tai chi or exercise teacher. If you are especially interested in medical knowledge of arthritis, “Overcoming Arthritis'” written by Dr Lam and Judith Horstman is a valuable resource for both you and your participants. Guide for the training workshops: The key is to have the preparation done prior to the workshop and the ongoing training that follows afterwards. The overall training is comprehensive and practical; it consists of self-study and preparation, face to face learning, and ongoing support and resources with updates required every two years. It also incorporates your knowledge in health, fitness and tai chi to make your training easier and more rewarding. Our focus is on training safe and effective tai chi for health program instructors for their community. The training is specific, enjoyable and practical. Almost all of our 20,000 plus trained instructors enjoy completing their training in minimum time. Once you have completed your training you will be entitled to registered as a TCHI Board certified instructor. We encourage everyone, every level of instructors to keep developing and growing their tai chi and teaching skills. Over 35 medical studies have shown the Tai Chi for Health programs and our training to be effective and safe.